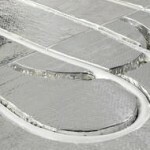 Most underfloor heating systems are called “wet” underfloor heating systems. They use a water based fluid in pipes to transfer heat throughout the house. These water based systems are usually installed with heating systems that use Heat Pumps or standard Oil, Gas or Wood burning boilers. The boiler produces heat and heats the fluid in the pipes which is then pumped around the house transferring heat as it goes. We supply a number of different systems depending on your needs. The two main brands we supply are Optiheat and Prineto. 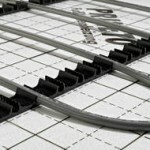 Prineto is a German manufactured underfloor heating system. As with most German made products the quality is excellent but at a great price as well. The systems range from those suited to residential houses and apartments to large scale commercial installations. 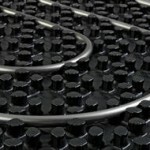 This is the standard type of underfloor heating system found in most houses and the most cost effective to boot. When Time is Money – Ideal for particularly fast and clean laying in houses, apartments and offices. Ideal for lightweight constructions and prefabricated housing – near passive houses are a great fit. The Prineto Thin Bed system is the new option available for people with low ceiling heights or low installation depths – these issues are now no longer a problem. Till now complex laying work and low ceiling heights put many people off installing underfloor heating such. 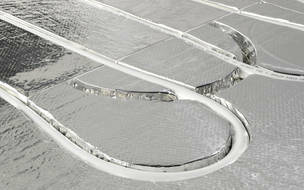 but now the PRINETO thin-bed underfloor heating system with a maximum height of only two centimetres is a great option. The system is extremely thin and can be laid quickly and cleanly on all existing flooring. Thanks to Prineto’s mature technology underfloor heating systems are child’s play to lay giving homes high grade heating even at extremely low temperatures – great with heat pumps. If you are an architect you can open up completely new possibilities for your customers during renovation and modernisation of their property by using PRINETO thin-bed underfloor heating. 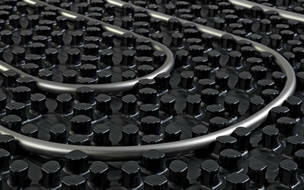 OptiHeat is the name of a unique and extremely low temperated system for waterborne underfloor heating. 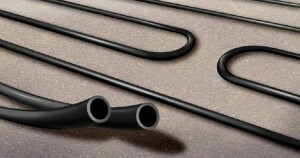 With OptiHeat underfloor heating, you will save money because of the low temperature in the floor pipes. In regular radiators the water must be over 50 °C in order to be able to heat up a room in the middle of the winter. With OptiHeat all you need is a water temperature of 30-35 °C. This is because the whole floor becomes one big radiator, due to this the surface of the radiator / floor needs to be only 1-2 °C above the room temperature. Underfloor Heating is ideal for wet areas such as baths, shower rooms and kitchens where the floors will dry off quickly. The low temperature reduces energy consumption and makes it possible to have an effective redistribution of energy between rooms. The Optiheat underfloor heating system allows for the indoor temperature to be reduced by up to 1-2 °C below what is common with regular radiators. which gives a reduced energy cost of 5 to 10 percent. Redistribution of underfloor heat heat means that the excess heat in a room or part of a hall is transferred to another place where a shortage of energy is present. 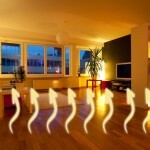 On particularly warm and sunny days the OptiHeat system shuts off the heating source automatically. When a part of the building is warmed-up by the sun the other parts also gets warmed-up. This is because the underfloor heating constantly circulates between all parts of the building. In other floor heating systems thermostatic valves prevents redistribution. In the OptiHeat system redistribution is enabled because the circulation pump is constantly running. OptiHeat provides the lowest building heights in the market depending on which setting-method is used. The setting-methods that is close to surface have a quick regulation in the case of sudden temperature changes. The electronic micro computer also reacts with an accuracy of 0,1 °C. The system is superior when it comes to providing a smooth and comfortable indoor-climate. 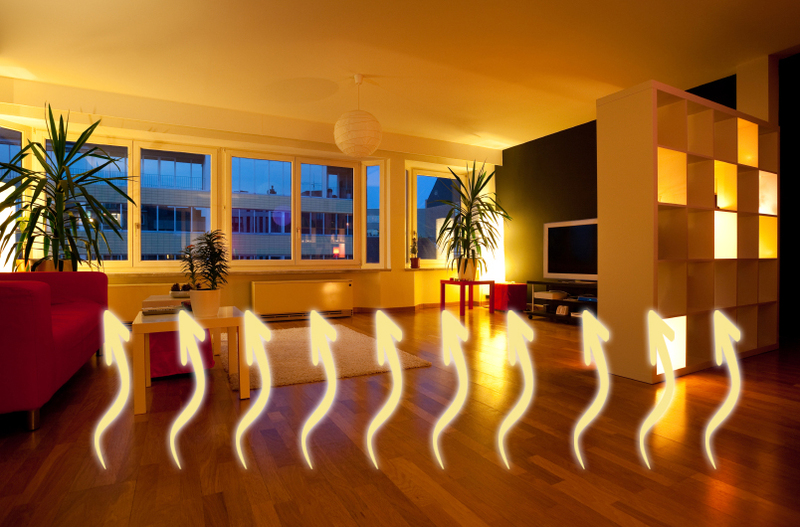 You also get rid of radiators and blowing fans that collects and spreads dust and alergens through the air movements that these systems create. This provides a healthier environment for everybody and especially for individuals with allergic troubles. 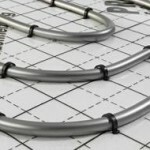 OptiHeat underfoor heating suits new constructions as well as existing buildings and can be connected to heat pumps or boilers for oil, wood, gas, electricity, etc. The system can also provide itself with energy with redistribution. 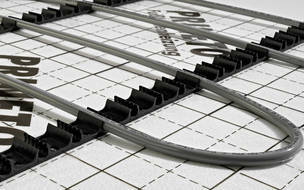 The OptiHeat underfloor heating system is reliable and durable. Few components of the highest quality results in none or low costs of maintenance. All the components are made of bronze, brass or copper. The OptiHeat underfloor water heating system was originally developed for big halls for customers with high demands on comfort, energy effectiveness and economy. Customers who have already chosen the OptiHeat system feel that the low energy consumption combined with the absence of maintenance is the strongest argument for choosing OptiHeat. 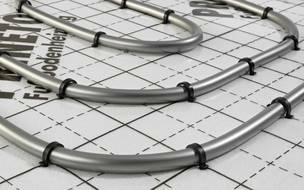 While there is a good deal of work you can do yourself, a hydronic floor is no less complicated than a zoned-baseboard heat system. It requires a boiler heated by gas, oil, or electricity. It requires valves and manifolds to distribute the water, as well as sophisticated thermostats to control the heat. While an electric system may be less complicated, certain systems involve heavy-duty wiring, and, in some cases, a new electrical panel. If you’re a hands-on person, find an installer who will work with you. Because running tubing or installing electrical elements is simple and time-consuming, it’s the perfect job for a homeowner. If you’re interested in saving a little money, let someone else design the system, then do the heavy lifting yourself. Please contact us for pricing information or on our local installation partners in your area. One of our expert team will be on hand to discuss your specific project requirements.